I absolutely Love Turkey but I also enjoy the many Thanksgiving side dishes. Most of us have tried Candied Sweet Potatoes, Sweet Potato Casserole, Green Bean Casserole, Mashed Potatoes, Stuffing, Roasted Butternut Squash, various ways to make our Turkey and Gravy and other somewhat traditional side dish recipes for Thanksgiving. For my family’s Thanksgiving we always try to have a few unusual side dishes thanks to my children who love to try new recipes. Here are some different sides that you can be proud to serve. If you try any, please let us know what you and your guests thought ~ we always love to hear from you ~ come over to facebook and let us know. Dissolve Jello in boiling water. Add berries, stirring until thawed. Fold in the pineapple and banana. Pour one-half of the mixture into a glass or crystal container, no larger than 8′ x 8″. Chill the one-half of the mixture in its serving container until firm. Do not chill the remaining mixture. Gently spoon the sour cream over the chilled Jello mixture. Pour the remaining mixture over the top. The traditional recipe calls for an 8′ x 8″ x 2″ Pyrex dish, but I use a cut-crystal bowl. The sparkling red salad is absolutely gorgeous in the crystal. You could also make individual servings in wine glasses. Make sure that the bananas are not overripe, so they don’t get mushy. You could also sprinkle chopped pecans over the sour cream. This works well as a filler on your buffet, as a substitute for cranberry sauce if you are not a cranberry fan, or as a fresh light dessert. submitted by Bobbie Bushey https://www.facebook.com/GrannysSquare It’s like eating pink sherbet ice cream with a little texture to it. Delicious! Place all in food processor and grind as fine as you like. Put into bowl; add 1 cup sugar and 1 12oz container CoolWhip and mix well. My son made this for us 2 years ago for Thanksgiving. A bit of work, with lots of flour in the kitchen, but boy was it delicious. Skinny Forks has a Simple Pumpkin Gnocchi Recipe to try that just gives you the basics. You can then feel free to make whatever sauce suits your fancy. The pumpkin Gnocchi that we enjoyed had a brown butter sage sauce on it that was truly delicious. Rachael Ray has a Pumpkin Gnocchi Recipe with a brown butter sage sauce that you just might want to try to wow your guests! Spinach Gratin from Ina Garten has been a staple for us as one of our Thanksgiving Side Dishes,. It’s one that is a must for us each year. My family loves the many different Thanksgiving Side Dishes, but this one is a family favorite. My daughter made it for me and I enjoyed it so much I made it a few months after the holiday. Why wait a year for something so delicious? I bake the 2 loaves and freeze one for when I have company. I hope we have given you at least one new side dish that you will try this year. Enjoy the Turkey, all the Thanksgiving Side Dishes,the Holiday and most of all your family and friends! In addition, if you’d like some interesting ways to use your leftover turkey, be sure to check these ideas out! 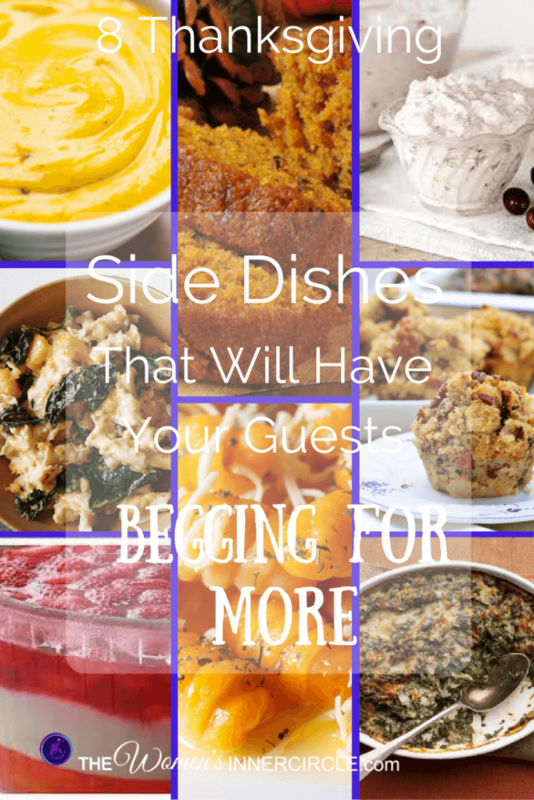 You can also serve them with these Thanksgiving Side Dishes. If you have a great recipe to share, we would love to feature you and your recipe.